All of our USCG Licensed and Insured Captains sport at least 21’ Bay boats with toppers and spacious decks. All fishing trips are either inshore or nearshore pending conditions, and go out of Sarasota down to Boca Grande. Typically, we fish in the morning, and hunt in the afternoon pending conditions and at the guides discretion. Let’s land your Snook, Redfish, Trout, Tarpon, Gag Grouper, Flounder, and the fast Pompano near the Beach and Back Country. 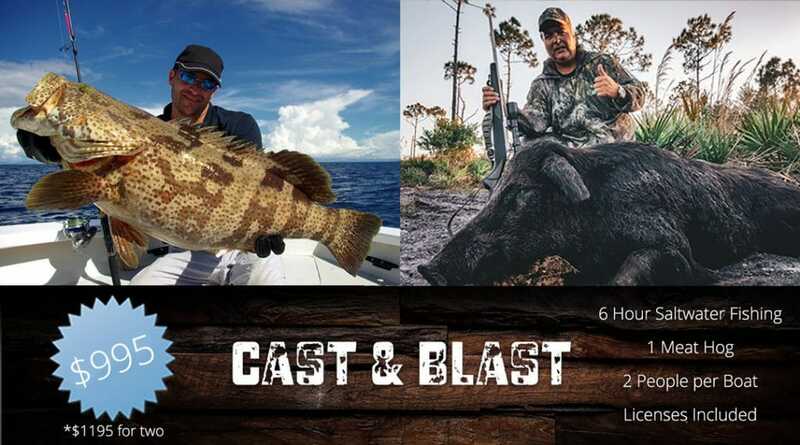 Join us for a Cast & Blast where we take our guests out saltwater fishing in the Bay for six hours, and top it off with one meat hog hunt. We include the licenses that are required. This trip can be over one or two days. Enjoy a fishing and hunting trip all rolled up into one! A booking for South Florida Trophy Hog Hunting has been removed from your cart due to inactivity.